We are often not aware of the vast majority of products that we use in our daily lives being created with chemical substances. However, despite their prominence, some groups of chemical substances may be dangerous to health and the environment. With an increase in these products, in 2006, the International Conference on Chemicals Management reached an agreement on the adoption of a Strategic Approach for International Chemicals Management (SAICM). The aim of the SAICM, as an international political framework, is to promote a sound management of chemical products, ensuring that from 2020, chemical products are produced and used in a way which significantly minimises their adverse impact on the environment and human health. 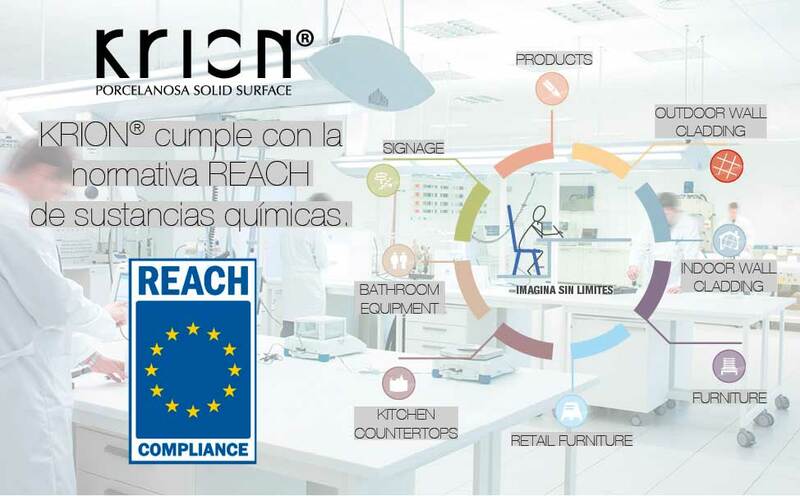 In the European Union, contribution to the SAICM was carried out through the application of REACH (Registration, Evaluation, Authorisation and Restriction of Chemical Products), which took effect on the 1st of June 2007 (CE number 1907/2006). Before its initiation, most chemical products (96%) did not require a risk evaluation before being introduced on the market. The REACH regulation regulates chemical products which are being produced or included as substances in mixtures and in finished products on the EU market. PORCELANOSA Group, and in this case KRION®, once again fulfilling its commitment to offering its clients the best possible product with a high level of development and quality, strengthen our commitment to the environment, creating tests to verify that none of the 161 substances set out in the latest update of the SVHC (Substances of Very High Concern) list, published by the ECHA (European Chemicals Agency), are present. With certifications issued by external laboratories, KRION® fulfils REACH regulation Article 7 “Registration and Notification of substances contained in products”.